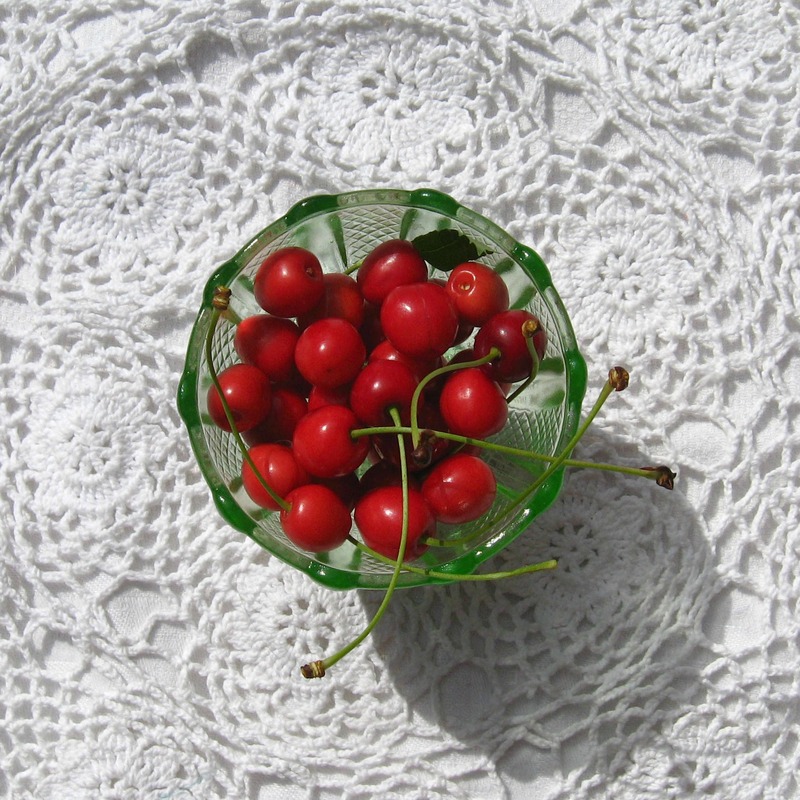 wild cherries and a raspberry sorbet for breakfast….. I don’t want to grumble about the weather, it’s sunshiny and warm, and it’s lovely not to be all cooped up indoors out of the rain…however, it’s somewhat more than pleasantly warm and in true English weather form has gone from still pippy in the evenings to “phew what a scorcher” almost overnight……the last couple of days has seen me slowly melting, looking all pink cheeked and frazzled by mid morning….. The last few mornings I’ve been up and out of bed about half five, then I’m outside watering everything and tending to plants in the garden before I need to wake the household for breakfast…any chores are done as early as possible,groceries are shopped for first thing and by eleven I’m all pooped out, too warm to do much more than sip cold drinks and sit in the shade. Walking to the shops I’m always peering in hedgerows, and up in trees, seeing what’s ripening and this morning I picked a huge handful of small wild cherries from one of the many fruit trees that are dotted along the hedges and walk ways around our home….the cherries are smaller than the ones from the shops and are slightly sharper but no less lovely tasting, just perfect for eating when I’m sitting on the back door step when I get back home. The cherries are hard to pick as the trees are rather tall and the fruit is all quite high up but with a bit of stretching I was able to harvest some fruit for a free snack. I’m a bit like a hobbit in that I like a second breakfast, first breakfast is eaten not long after I’m up, and then second breakfast happens around ten. 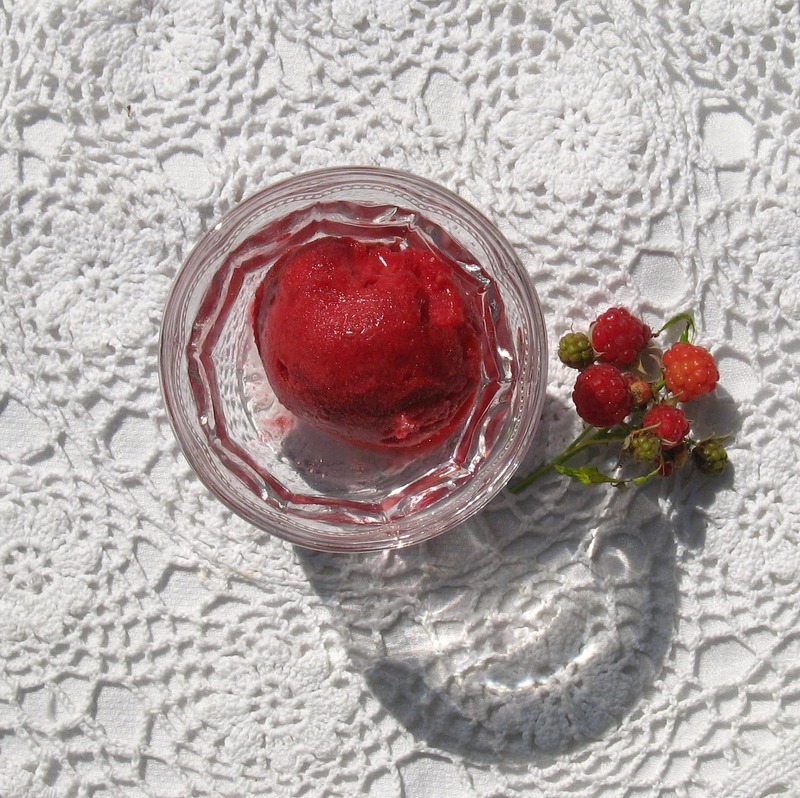 As it was so hot today I thought I’d finish up the raspberry sorbet I made at the weekend, intensely fruity and syrupy sweet like a squash drink, it’s been one of the nicest sorbets I’ve made. I’d half forgotten about the raspberries still in our freezer and was wondering what to use them for (we’ve still got jam and I don’t like cooked fruit puddings)…I was toying with the idea of an ice-cream but then decided to make a sorbet as I thought that would be a bit more refreshing……this was perfect for using frozen fruits that have been forgotten about and after reading about a peach ice-cream in a Hugh Fearnley Whittingstall book that uses tinned peaches, I’m now thinking to try a sorbet with those…or tinned pears for a pear drop flavoured ice pudding. Bring the reserved raspberry liquid and the castor sugar to a boil and then simmer for about 5 minutes. Allow it to cool and then add in the orange and lemon juice. Stir in the raspberry puree. Freeze for around 4 hours. Whisk the egg white if you’re using it so it forms stiff peaks. Carefully fold in the frozen raspberry puree a bit at a time so it becomes a lovely intense pink foam. Re-freeze until the sorbet is firm (another few hours). Just using the drained liquid from the frozen raspberries rather than adding water means the sorbet is incredibly intense and fruity…we had some with a homemade dark chocolate and it was the best combination.